Motorola MBP25-2 Review: Should You Spend Money on This? Motorola MBP25-2 Review – Should You Spend Money on This Baby Monitor? Quick summary: This product allows you to monitor your babies as you get on with your house chores. It comes with two cameras and a capability to connect an additional camera, allowing you to monitor multiple rooms from a single station. Read my Motorola MBP25-2 review below to find out more about this great product. The monitor rarely ever loses its signal. This means you are assured of uninterrupted monitoring of your baby. It allows you to turn off video and leave audio on. Not only does this save energy, but it also lets you monitor your baby by listening to sound only as you to continue to work. The infrared capability of the camera allows you to monitor the baby even in pitch darkness, without needing to turn on lights, especially if lights excite your baby and prevent it from going to sleep. The two-way talk back feature allows you talk to your baby without having to go to their room. You can even sweet talk them back to sleep using this feature. The zoom feature lets you adjust the picture clarity to your liking especially if you need to look at your baby in a more close-up way. The gadget lacks the ability to divide the screen, which means you have to manually switch camera, although there's provision to set it to switch automatically. The audio of the gadget is very sensitive, which makes it hard to filter the unnecessary noise picked by the microphone. This product uses the 2.4 GHz FHSS wireless technology, which is more superior to other wireless technologies in similar devices. The technology gives a strong signal which easily permeates walls without loss of intensity minimizing the chances of you becoming disconnected from the cameras in your baby's room. It also increases the range of the distance the signal covers compared to other monitors. The monitor comes with a 2.4-inch color LCD that displays crisp images allowing easy viewing without having to strain your eyes. On display is an LED indicator of sound level to give you an idea of the intensity of the noise coming through. It also comes with two cameras that are easy to mount in the room where the baby is. The cameras are small, but they can produce high-quality images that are not distorted giving you life like scenes. The two cameras are movable and can be mounted in any room easily without requiring any skill. The cameras also have an infrared night vision, and you can use them even in rooms with lights off. This gadget goes with a high sensitivity microphone that captures every sound﻿﻿﻿﻿ in the room even the faintest room to ensure you don't miss out on anything happening in there. The microphone will alert you about any disturbance to the child, which will enable you to make quick decisions. The battery drains too quickly, less than 3 hours, but you can always plug it into a socket and keep it plugged, so you don't have to worry about the battery going low. And since you do not need to leave the house with it, it's no issue that it needs power now and then. The fact that the monitor lacks onscreen video splitting is another issue. However, you can take care of this by setting it to automatically switch between the two cameras after every ten seconds to still get images from the two cameras. The thermal night vision cameras are excellent giving you a clear video of your baby as it sleeps. And it works even in total darkness. The monitor comes with the two cameras already paired to the parent unit saving you the pain of having to set it up yourself. The signal range is longer, an advantage if yours is a big house. Going by the reviews this device has received so far, it is apparent that it is quite popular. People find it quite affordable when compared to the features it offers. And its ease of use scores highly among parents. 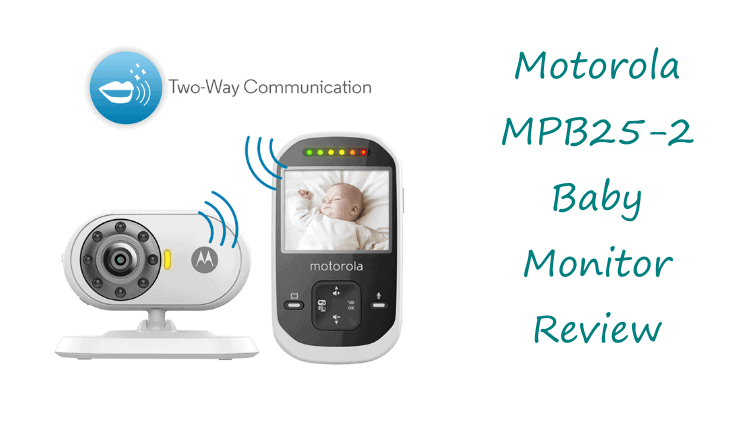 The Motorola MB 25-2 will give you a peace of mind with the many features it offers which are all geared towards making watching over your baby as easy as it can be. Purchase it from Amazon today and have it shipped right away.